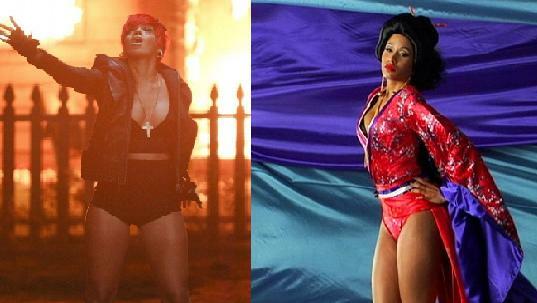 Islandista: Islandistas Rihanna and Nicki Minaj making history! Islandistas Rihanna and Nicki Minaj making history! ... And all that ... because we are all kinds of proud of our islandistas Rihanna and Nicki Minaj these days who have been scaling the Billboard charts and making history in their own ways. Rihanna's collaboration with Eminem - the gritty and painfully close-to-home Love The Way You Lie hit number one on the Billboard pop chart (i.e. the big one this week). While that is great, the real accomplishment is that this is her sixth number one - meaning that she is tied with Mariah Carey, Beyonce and Lady Gaga for most number ones in the Soundscan era. Now just to explain that since by now you might be saying "but wait, isn't it the Beatles that have the most number ones ever?" - music chart ranking is basically divided into the pre and post-Soundscan era. And in that time, Mariah, Beyonce and more recently Lady Gaga have dominated (Gaga in a staggeringly short time - less than two years). And now our own islandista Rihanna has joined that illustrious company. People can hate all they want on her voice but they can't stop Ri-ri boy - she has that certain je ne sais quoi. Nicki Minaj is also holding on to that number one spot - her Annie Lennox sampled hit Your Love has been at number one on the BillBoard rap charts for 12 weeks now - and she is the first female rapper to hit number one in eight years - since Missy Elliot with 'Work It' in 2002.